All transactions are safe and secure with a reliable history in online purchasing behind each of our associates. 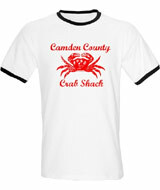 Buy the Camden County Crab Shack t-shirt to own My Name is Earl clothing and merchandise. The Crab Shack is a popular Camden County restaurant and bar where Earl, Joy and Randy hang out. Their friend Darnell (a.k.a. the Crabman) works there, and he often hooks them up with "bowls full of stuff that he's not legally allowed to put in the crab cakes." Darnell and Joy eventually marry. Earl remains friends with Darnell, most likely due to the fact that Joy tricked Earl into marrying her anyway. Pair this with a My Name is Earl Crabman t-shirt and tell everyone you work at Ernie's Crab Shack. In addition to the Camden County Crab Shack tee above, browse the My Name is Earl Clothing Gallery for more apparel like men's and women's clothes, kids shirts or hoodies.